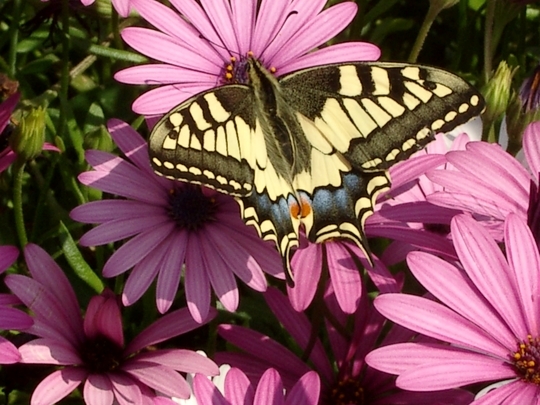 A beautiful swallowtail on a purple osteospurmum plant, I waited ages for it to settleand chased it all round the garden. Aw thanks, this butterfly was really friendly, it spent about a week in the garden and didn't flutter like ordinary ones, it sort of glided over the plants. What a wonderful picture. I think she was waiting for "my close up Mr. De Mille"! Really great pic. The colours, shade and sharpness fantastic. Superb photography Janey ! Well worth the wait ! Why thank youi! Where we lived the air was really pure and clear during the summer months and it seemed to hold the light, different to good old Blighty! This one went straight to my favs. Excellent photography! Have you got this one framed? Thanks Tasteyg, they're beautiful creatures aren't they, thought about maybe a jigsaw for my granddaughters! Amazing, absolutely lovely. Lets all plant more for the birds, bees and butterflies. I totally agree Wizzbang and welcome to GOY! I think we really need more sun for them though. We had a wonderfully sunny morning the other day and the garden was full of butterflies on the buddlieas, come the afternoon, grey sky and not one butterfly to be seen. Fantastic photo colours so sharp, well done . fabulous photo janey, and what a beautiful subject. well worth the run around. Tref. Yes Janey, highly recommended. In my favourites. I don't suppose that I'll ever see one in my garden in the Midlands. I would have to go to Stratford - on Avon 'Butterfly Farm' to see one live. They have quite a good collection there if you're ever around that way. lovely pic - I've never grown these but have often thought of it - are they annuals or do they come year after year? I bet it led you quite a chase Janey but all your effort was certainly worth it by the beautiful picture you captured. Awesome butterfly and great photo all round. Well done! This photo is of species osteospurmum.